About ICP Networks | ICP and E•ON Case Study | An ISO9001 & ISO14001 company. ICP Networks honoured to have been selected for National Case study on Renewable Energy by E•ON. 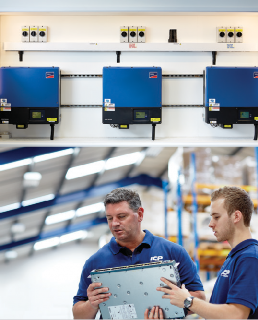 Click this link to read more about ICP Networks Sustainability case study by E.ON and click the PDF's below to see the case study. "We installed 200 solar panels with a capacity of 50kW. 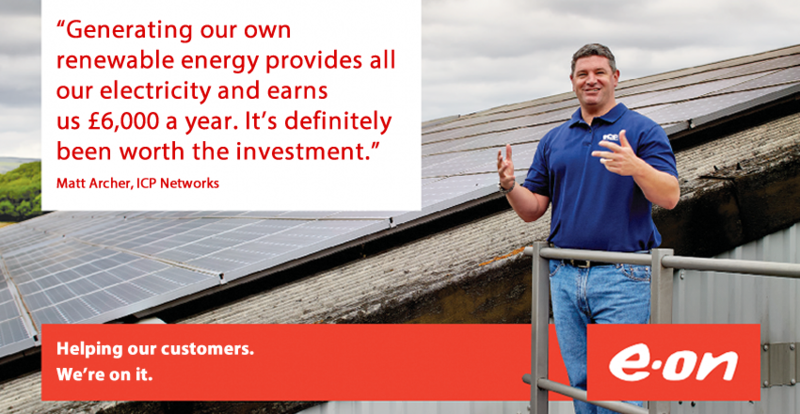 Last year, we generated more than 48,000kW, which provided all our electricity and earned us £6,000 in Feed-in Tariff (FiT) payments, whilst saving 25,370kg of CO2". "Installing solar panels is easily the best decision we've ever made and it's inspired us to introduce more energy saving ideas, including high quality insulation, motion and lumen sensor lighting and on-demand infrared heating. 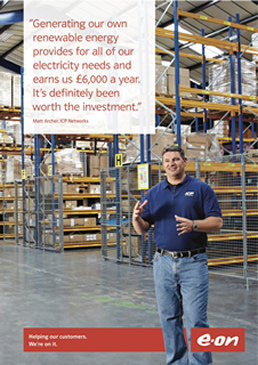 Changing the light fittings reduced our lighting energy use by 90%". "We've achieved ISO 14001:2015 accreditation for environmental management which has boosted our profile, especially with our clients, who are some of the most technologically advanced companies in the world". "E•ON have supported us every step of the way and their FiT payment scheme runs really smoothly. The service they provide and the helpfulness of their staff is a great help!"